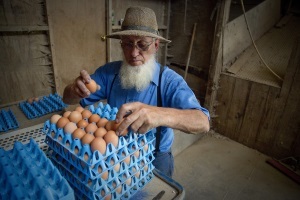 Most Amish farmers are conventional farmers. But organic farming has taken off in some communities over the past decade or two despite some practical and cultural roadblocks. A glut of organic milk has sunk prices across the United States, threatening livelihoods and rekindling long-standing suspicions that some of the large organic dairies that have emerged are swamping the market with milk that does not meet organic standards. Over the years, some of these very large dairies, most of them in the West, have been cited for violating organic rules by the USDA or inspection agencies. To the chagrin of many here, most have been allowed to continue operating. Over the past year, wholesale organic milk prices have dropped by over 1/3 in the Kalona community. Amazingly, about one out of every six or seven gallons of milk is sold at conventional prices or is simply dumped (a practice which is apparently happening across the industry). One of the nation’s largest producers, Aurora Organic Dairy, (supplying outlets including Walmart and Costco) was reported last month to have not meet organic grazing requirements. Farmers in Kalona and others suspect that Western mega-dairies may be consistently failing to meet grazing standards. Herd sizes at large dairies can exceed 10,000, while Kalona Amish herd sizes are below 100. The larger the herd, the more pasture is required to feed it. But at a certain point, the acreage needed to feed a herd grows so large that it’s impractical to expect a cow to walk all the way to the pasture’s outer edges to graze and then back to the barn, typically twice day, to get milked. Some farms do have multiple milking facilities. Cornucopia, a watchdog institute, feels the USDA is not doing enough to find and enforce violations against the big players. Has the time to go organic passed? Organic farming probably looked like a great opportunity five to ten years ago. At that time organic dairy seemed to be transitioning from a novelty phase to something more accepted among Amish. Ten years back I would run into Amish organic farms from time to time but they were still somewhat a rarity. But the ones who were doing it were quite enthusiastic about the significantly higher milk prices (once you get through the three-year conversion period of course). Now as is typical, more players have entered the industry and the bigger businesses are leveraging their scale – even though I’d argue the very perception of “organic” farming suggests a smaller more labor-intensive operation (incidentally more aligned with the image of the typical Amish farm). Marketing organic milk from 10,000-cow mega-dairies feels something like selling mass factory-produced chocolate chip cookies as “homemade”. Even with the cute elves on the box I know these cookies didn’t come from grandma’s kitchen. In any case, if the perception that large producers may be skirting the rules spreads, consumers are likely to get more discerning about who is producing their organic products. According to the article, Costco plans to continue using Aurora, while Walmart has not made a statement on whether it will continue with Aurora. Small-farm organic producers like the Amish at Kalona are no doubt hoping the USDA will do better at finding suspected violations (assuming their suspicions are accurate). I assume the big dairies are following the pattern New Zealand uses: grow and maintain special grass fields to provide better grazing results in a more confined space. They probably have to use regulated fertilizer to quality as organics, too. The grass won’t grow well enough on its own. I absolutely agree with that statement. As much as “organic” is practiced by small producer a hundred percent, in case of tremendously big it’s impossible to bring the same quality standards as small farmers. Plus i think the government loosened rules for “organics” to satisfactions of BIG business. I would have to say my suspicions are the same as D’s, in regard to Big Business being catered to by the government–especially today. Sad for the small Amish farmers who are truly organic. It doesn’t seem as though the Amish have the clout to get things investigated & changed as far as organic farming goes. Guess you’d need an Englisch whistleblower to get the ball rolling. This kind of press will be bad for the big producers, so they may wield some sort of clout via the media in this case. The Kalona Amish are generally more technologically progressive and we can assume are comparatively less media-shy, so we’ve got Eldon Miller in a photo and Amish contributing to the article. I imagine at the least this type of press will encourage organic milk consumers who care about the origin of the product – and if you’re drinking organic, you kind of care by definition – to be a bit more inquisitive about who’s producing what they’re buying. I am suspicious of any large manufacturer selling organic food. I try to buy most of my organics at local farm stands or health food stores. Most organics you can taste the difference. I don’t know about milk because I am lactose intolerant. Debbie H: I suspect that you are correct, large companies and “organic” don’t seem to fit together. I once heard Joel Salatin, (one of the early proponents of “local” though not necessarily “organic” agriculture) say that the organic movement was rife with abuse and getting worse. That is why he didn’t fool with being certified, though he pretty much followed organic practices. elaine: What the article is saying is that with the mega dairies moving into the organic production world, supply has gone up exponentially. Unfortunately, with increased supply comes lower wholesale prices. Even more unfortunate is that the large, corporate owned dairies will be much better positioned to withstand the lower prices than the smaller farmers will, regardless if they are Amish or not. is someone imposing a limit on the amish as to how large or small their herds can be? are they getting paid less because they have chosen to have smaller herds? it all comes down to: choices, the equal opportunity gift that we all possess. I’d agree with your point – limitations come as a consequence of choosing to live a certain way. But I think they’d like to assume a more or less equal playing field regarding everyone following the same rule book (even if practically speaking scale gives advantages little guys don’t possess, as Oldkat points out above) – and that for me was the strongest point of this article. It sounds like the bigger dairies might be getting away with skirting or bending (or let’s just say breaking) the rules as it comes to fulfilling organic requirements (the grazing issue). Oh, I am under NO illusion that the small producers are on a level playing field with the big producers. Nor am I inclined to believe that they (the big players) follow the rules as strictly as the smaller producer does. In fact, the “rules” tend to get stretched over time to accommodate the big players and in some cases the certification process has become a joke. Just this afternoon I found a March 2017 copy of a publication that I have subscribed to for years called The Stockman-Grass Farmer(TS-GF), which I had apparently stuffed into a book bag that I use to keep up with misc small items and thus never got around to actually reading that issue. TS-GF has pretty much been THE industry voice that has promoted grass finished beef, grass based dairy, local-centric food production, pastured poultry, etc. for the past 20 plus years. When NO ONE was talking about these issues; TS-GF was out beating the drum. The editor was a guy named Allen Nation, who was a great guy, a very kind and gentle spirit, as well a true visionary. Unfortunately, we lost Allen to a heart attack last Fall. Joel Salatin was tabbed to be his successor, which is a good thing. There will never be another Allen Nation, so I won’t say that Joel was picked to be his replacement, or to fill his shoes. NO ONE could fill Allen’s shoes. He was THAT dynamic. That said, Joel is doing and will do a fantastic job carrying the torch in Allen’s stead. In the issue that I found today in the bottom of my book bag is an article about organic certification entitled “To Certify or NOT to Certify, That Is the Question” in his forum called Meadow Talk. There is FAR to much to the matter for me to cover here, but I urge anyone that is even remotely interested in this subject to get a copy of this article. It is eye opening to say the very least. If you interested in the things that go into producing grass based animal protein, even if you are not interested in being a producer yourself; then TS-GF is your Go To source. As an aside, I saw examples of grass based production on Amish / Mennonite farms the week before last when we were in Lancaster County, PA for Horse Progress Days that I am pretty sure were inspired by this publication. They use to offer a free sample copy for those that might be interested in subscribing. Not sure if they still do this or not, but their toll free phone# is 1-800-748-9808.
when products are available this gives the people a choice as to what they put in their bodies. has anyone noticed that our average longevity has gone down? Clearly, one thing that can contribute is a lifestyle. food is the fuel that powers us. our bodies were not designed to deal with chemicals found in modern food and food that is marketed as food. while sugar is the fuel used by the body it is processed into the types the body requires. processed types and of such quantity leaves us starved for the other nutrients the body needs. We cannot produce it in a pill. I was born poor and had the good fortune to spend every summer on my cousin’s farm. we ate the freshest of everything. My breakfast was six eggs and half a pound of bacon with fresh briskets and raw honey. we worked the fields until dinner which was again fresh vegetables and meat( the cheap cuts)and only a little time to talk about tomorrow and what needed to be done. At seventy-five I take only pain medication for an injured back. a gift from a guy that thought his cell phone was more important than his driving. now I suffer from the effects of the drugs upon my brain and sound like an idiot if I don’t quit posting before they take effect. I can and do walk several miles and teach skills learned when young to any who want to listen. Now I see people younger than myself who die from the body breaking down before their time. natural food will help you survive longer and healthier I can still enjoy my great grandson and show him many things. the benefits are great but the threat from government may be greater. it is up to each of us to provide the controls needed on government. Knowledge weighs nothing but useless if we don’t use each must choose our own path. to make the correct choices gather the knowledge you need. it is very gratifying to watch your family enjoy their lives and know that you contributed to it. as you grow older you realize what the real treasures in life are. The only piece of advice I will give is to take the harder path. if you fail you have the easier one left. fail on the easy path and you have no choices left. regrets are listed after you die. may it always be short! My opinion it is always better to be cautious of larger farms, chicken farms, pig farms, etc., they add chemicals, and steroids, that are hidden in the ingredients under different names that the public are not aware of the names. Lacking grass in feeding the animals is unacceptable! I may pay a lower price for what I buy from these framers in the market, “you get what yo pay for – a lower grade of the product.” The best comes from the smaller farmers, and therefore tho the price is higher, it is worth the money, as well as better for my health. Why don’t amish focus more on local products? Seems their farms are wasted on corporate farming when they could sell organic dairy to locals or amish people could start their own co ops. I see many Amish people are quite wealthy. They already have the land. They really can provide for themselves easily and make money in other ways. I don’t understand corporate farming and how it works. People like amish stuff so much they could start an Amish organic grocery chain. Been with Organic Valley for eleven years and have a 605,000 # quota with the farm. Old man time is slowing us down and we hope to pass the torch to a younger family or two in the spring. For someone wanting to get into dairying but has no market, we have a lot to offer. I answer all inquires but would really like to sell to Plain people. They know how to care for the earth.